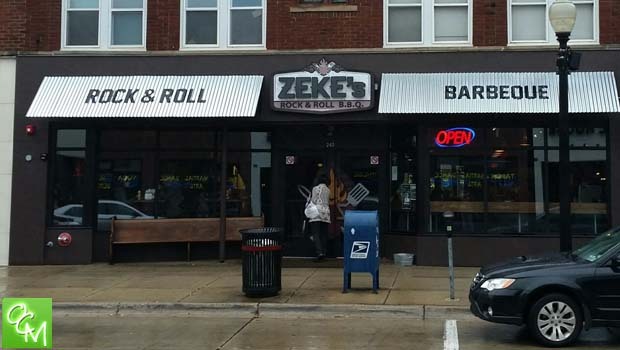 Zeke’s Rock n Roll Barbecue is located on W 9 Mile in Downtown Ferndale MI. Zeke’s BBQ menu offers a full-range of BBQ favorites such as smoked meats, smoked salmon, brisket, ribs, smoked turkey, corned beef, smoked chicken, pulled pork, bratwurst…and there are so many sides to choose from such as mac and cheese, Sriracha slaw, smoked beans, spicy chili, veggie mash, potato salad… you have to go so many times just to try them all. Each table at Zeke’s Barbecue is stocked with their unique BBQ sauces: Pineapple Habanero, Carolina Vinegar, Blake’s Apple, BBQ Mustard, and house BBQ… all are fantastic. Zeke’s BBQ has an extensive, separate drink menu. Wines, Cocktails with fun names like The Ginger Jack, Jalapenofest, Lynchburg Lemonade…, twelve draft beer options and a ton more bottled beers to choose from. Zeke’s Rock ‘n’ Roll BBQ has been around since January 2015. Zeke’s offers patio seating, lunch specials, Happy Hour, and Live Rock ‘n’ Roll performances (visit their website to see performance and ticket info). I really enjoy the atmosphere inside Zeke’s. Spacious, great music playing, rock and punk rock art on the walls, huge drink and food selections, and a fantastic “Downtown Ferndale” feel to the place. If you like Union Woodshop, you’ll likely have no qualms about the tastiness of Zeke’s Barbecue – and you’ll get more of it for less $. Zeke’s Rock ‘n’ Roll BBQ delivers excellent quality, very generous portion sizes, and awesome service. We can’t wait to go back.